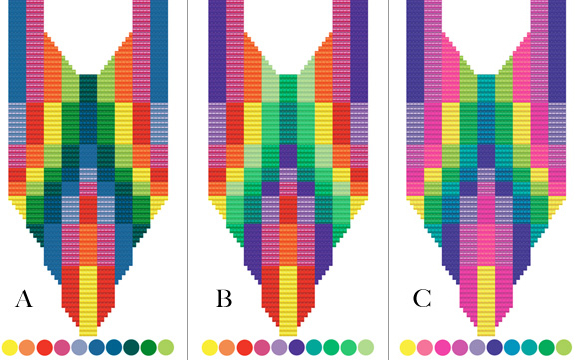 What happens when you remove one color from an analogous color scheme? Analogous schemes involve colors adjacent to each other on the color wheel. These schemes can have as many members as you like, as long as they are color neighbors. I’m often asked, “If I use all 12 colors on the 12-step wheel, is it an analogous scheme?” Yes! As long as you haven’t skipped any members along the way. But what happens when you do skip a member? I thought it would be fun to explore the results of an almost full-spectrum analogous color scheme. Using my quilt-inspired split-loom necklace, “Color Blocks,” (pattern available in my book, Out On A Loom) watch what happens when I remove a major color member from this 10-member palette. (I’ve kept the intensity of the colors the same). The original color scheme is the one above left. In version A I’ve removed all purple and violet. In version B all blues have been removed. In version C reds and oranges are gone; pinks have taken their place. I like observing my own reactions. When I compare each of these versions to the original, I immediately prefer the original. Full-spectrum schemes are so satisfyingly balanced and whole. However, when I stop comparing and sit with the other versions individually, I get to know them better. Within a few moments I can “hear” their voice separate from a full spectrum scheme. They then begin to appeal to me in different ways. Version A seems more quiet and stolid without the violet/purple/lavender family. I’m not drawn to it, but its interesting to note how the lack of these colors dramatically changes the tone. Version B, with its emphasis on greens and lack of blue seems younger, much younger than version A. And C is absolutely delightful. All that bright pink makes it so effervescent and playful. What happens in your eye-and in your mind-when you look at these 4 palettes? Which do you find more appealing and less appealing?